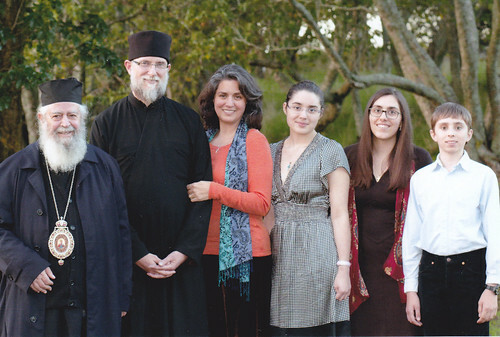 Father Paul, Presbytera Katerina, and their children are missionaries serving under the Omophorion of His Eminence Metropolitan Amphilochios of the Holy Archdiocese of New Zealand and Exarchate of Oceania. Father Paul has been a priest over 24 years, and is currently assigned as the presiding priest of the Church of the Holy Trinity in Auckland, New Zealand. His previous assignments were in the Greek Orthodox Archdiocese of America, and his missionary experience also includes work in Kenya and in India. The Metropolitan Amphilochios called upon the Patitsas family to help the Church of New Zealand with evangelization and Church planting on the islands of Fiji, Tonga, and Samoa. Through the efforts of His Eminence and dedicated clergy like Father Paul assisting, the Church is growing on the islands. In a few short years, with missionary coworkers from Australia, Greece, New Zealand, and the United States assisting on the Island of Fiji, there are now four churches, four clergymen, two nuns, an orphanage, a women’s shelter, and a growing number of baptized and worshipping faithful. Help further these efforts by joining the Patitsas family support team! Most helpful to the Patitsas family mission are prayer partners and those equally called to strengthen the work in this region through monthly financial support to cover their living and ministry expenses. Use the red link abaove to "Support This OCMC Missionary Family!" Assure Father Paul, Presbytera Katerina, their children, and those they serve of your constant presence with them, as they dedicate their lives in service to the Church of New Zealand and to the indigenous Pacific islanders of Oceana who await the fullness of The Gospel communicated in God's perfect context of their diverse cultures.